Whether you are about to buy your first, next, or last home, there are certain documents you will be required to apply if you are going to have a mortgage on your new home. In 2014 the Consumer Financial Protection Bureau outlined the type of information that loan officers would be asking for. Some of the documents are common sense items like pay stubs, forms of identification, and a documented work history. Unfortunately for many buyers, it is many of the other documents (i.e. asset statements, pension award letters, bonus information, and even Veterans Certificate of Eligibility depending on the loan type) they need to produce that catch them off-guard and often delay their home loan approval. This handy infographic identifies many of the documents that consumers need when applying for a mortgage. Use it as a guide and have peace of mind knowing you will have the required information when it is requested. This article on What Documents Do You Need When Applying for a Mortgage was written by Anita Clark. She helps consumers who are looking to Buy a Home in Houston County GA. Follow Anita on Google Plus. Amazing infographic about mortgage documents Anita. Many thanks. Did you make this infographic? 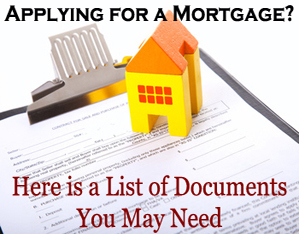 Looks like lots of documents are needed for a mortgage application. In 2007 the bank didn't ask me these many documents. Has anything changed since then? I mean, have the requirements become stricter? If yes, in what sense Anita? Thank you. Yes, my team does our own Infographics. Glad you like them Armen. Ncboy: The market crash brought about many changes (definitely needed)...the days of wild west loans are gone.